Yes I have been painting celebrities. My most collected…Marilyn Monroe. Here’s an article that I know you’ll enjoy. Read about all of the dogs in Marilyn Monroe’s short life. 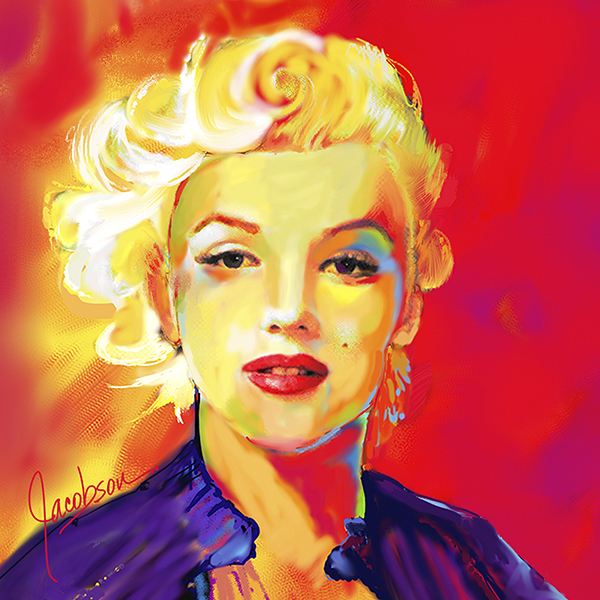 I would like your opinion…Do you think I should paint Marilyn with one of her dogs? Tell me in the comments below. THANKS SO MUCH. 1955 – Milton Greene took pictures for Look magazine editorial on Oriental Gowns, Milton photographed Marilyn at his New York studio on March 28, 1955. The complete motif included an embroidered ottoman, cushions, folding dressing screen, and Pekinese dogs. Snuggling with a Pekinese during a shoot on Oriental Gowns, Marilyn simply glows in her black robe. ARTICLE by Kathleen Crisley, Principal and Owner of Canine Catering Ltd in Christchurch New Zealand. Over the course of her life, Marilyn Monroe owned a number of dogs. A black and white mixed breed by the name of Tippy was given to then Norma Jean by her foster father. A Spaniel named Ruffles was an early companion around 1940-1942. Her husband Jim Dougherty bought her a collie named Muggsie. Around about the time that she was signed by Columbia Pictures in 1948, Marilyn reportedly owned a chihuahua but I can’t find a record of the name. During her marriage to Arthur Miller, a basset hound named Hugo was their companion. Miller retained ownership of Hugo when the couple divorced. Maf was a maltese given to Marilyn by Frank Sinatra. The dog’s full name was Mafia Honey in honour of Sinatra’s alleged mafia connections. When Marilyn died, the dog was given to Sinatra’s secretary. In 2010, author Andrew O’Hagan documented Maf’s story in a book The Life and Opinions of Maf the Dog, and of His Friend Marilyn Monroe. Written from Maf’s point of view, we read about Marilyn’s last two years (she took the dog to Hollywood, New York and to Mexico). Beautiful portrait of Marilyn. I know you could do a beautiful portrait of her with her dog. Everyone’s face softens a little when they are holding their dog–even hers, in photos.